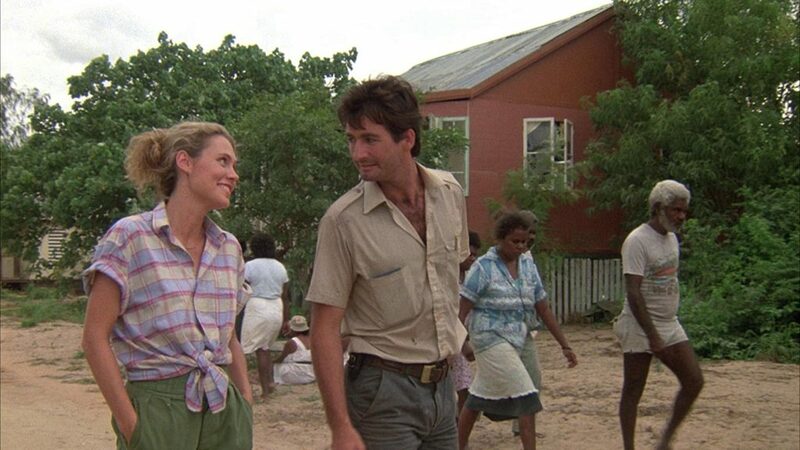 CAST: John Jarratt, Nikki Coghill, Max Phipps, Burnam Burnam, David Gulpilil, Ray Meahger. PLOT: In Australia’s Northern Territory, a massive saltwater crocodile is attacking and killing people. 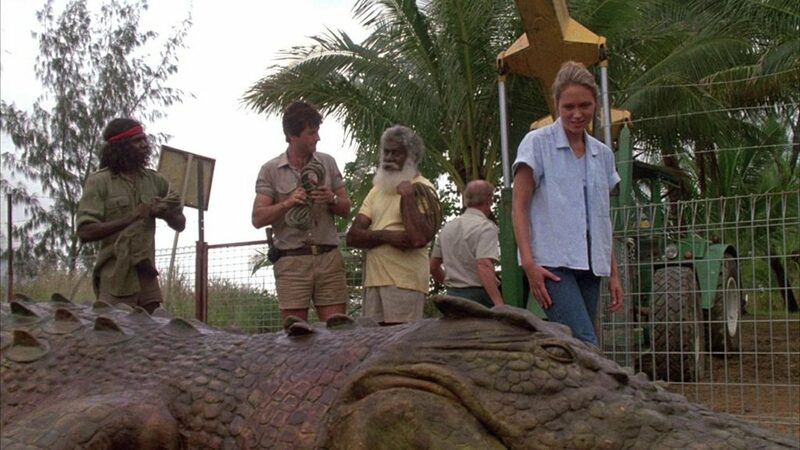 A ranger named Steve Harris (John Jarratt) is assigned to deal with the killer crocodile, but he finds himself at odds with the local Aborigines, who believe the crocodile contains the spirit of their past, and want this goliath-sized beast preserved. The ranger must work with the Aborigines to develop a plan to respect their wishes as well as protecting the local residents threatened by the crocodile. I know that it’s probably just me but no matter how many times that it happens, it always still boggles my mind how some films can be made and then suddenly be shelved for many years (and in some cases even decades) before they are released. There can be a number reasons why that is: there have been problems with the making of the film, the studio loss faith in the project, it tested poorly with audiences, it was just flat out bad etc. It’s an occurrence has happened a lot to many different types of films over the years but when it happens in the horror genre, it definitely gets the most attention from the film community. Just over the pass 10 years alone we have seen quite a few horror films get shelved for a long time before they were eventually released. While the quality of these particular films have ranged from the great (TRICK ‘R TREAT, THE CABIN IN THE WOODS) to the not-so-great (THE POUGHKEEPSIE TAPES, AMITYVILLE: THE AWAKENING), it doesn’t change the fact that how some of these films were treated is rather questionable to say the least. While this practice happens a lot in Hollywood, it has also occurred in other countries around the world as well. Even my home country of Australia is guilty of doing this too. 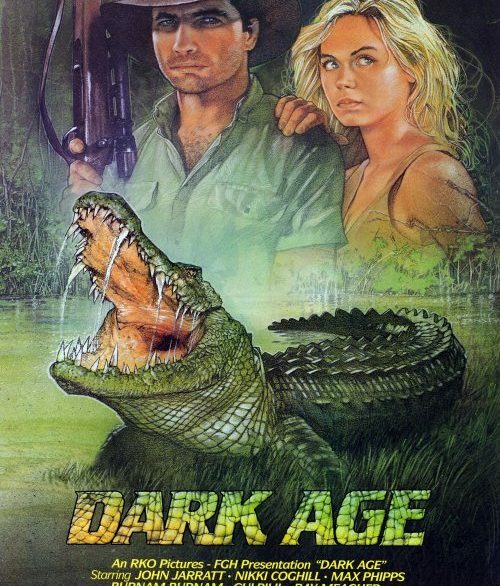 The most famous case of this happening to an Aussie film is without question the 1987 giant killer crocodile film DARK AGE. The film was suppose to released in Aussie cinemas in 1987 but due to various problems with its local distributor (which could easily be an entire article itself), DARK AGE was shelved indefinitely. After a whopping 24 years collecting dust, the film finally saw the light of day in Australia when it became available on DVD for the first time in 2011 and then a few years later on Blu-Ray. Now after decades of being know as a ‘lost film’ of Australian/Ozploitation cinema, DARK AGE can now finally be seen by Aussie and international audiences. 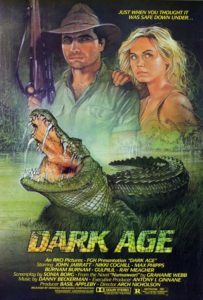 I first became aware of DARK AGE back in 2007 when WOLF CREEK writer/director Greg McLean’s own giant killer crocodile film ROGUE was about to be released in Australian cinemas (funnily enough that year also saw the release of two other killer crocodile films: PRIMEVAL and BLACK WATER, the latter also being an Aussie one too). In a lot of interviews and articles that I read on the film in the lead up to its release date, quite a few of them brought up DARK AGE in passing due the fact that film’s lead star John Jarratt had been cast in a supporting role in ROGUE as well (I have a feeling that this might have been very deliberate on McLean’s part). I never heard of DARK AGE prior to those interviews, but it did peak my interest in it. Even more so after hearing that it was up to that point been shelved in Australia for two decades. However after both hearing Quentin Tarantino rave about DARK AGE and seeing some footage from it during a segment in the 2008 documentary NOT QUITE HOLLYWOOD (where they showed the infamous scene from the film where a very young Aboriginal child gets eaten by the giant crocodile), I knew that I had to try and track it down. Since it was never released in Australia and had been out-of-print for a long time on VHS in the U.S., the only way you could watch the film at time was either as a bootleg or streaming somewhere on YouTube, which is how I able to see it (please don’t judge me). Despite the visual quality of the bootleg being rather poor, my first initial thoughts on DARK AGE at the time was an enjoyable if a little unremarkable film. However once the film became available in Australia on both a higher quality DVD and then on Blu-Ray a few years later, my appreciation of the film has grown more upon further revisits of it. In fact I would go as far as to say that it’s definitely best and most interesting entries in the killer crocodile sub-genre of horror. Two of the main things that I think make DARK AGE stand out more when compared other killer crocodile films (or even to many other killer animal films that came out during that post-JAWS period) is that 1. rather than just treating the croc ‘Numunwari’ itself as just some rampaging monster that needs to be killed to save everyone, the filmmakers instead take a far more interesting approach by having our central characters try and protect the croc from those seeking harm against it and 2. the story also delves into Australian indigenous culture/mythology by having ‘Numunwari’ be a sacred animal by the Aboriginal community within the film (which they call a ‘dreaming crocodile’). It’s these two aspects of DARK AGE that I found to be quite compelling since they both provided more extra thematic layers to its story, which I thought really elevate it from being just another standard killer animal film. This is film that definitely has something to say with the many themes that it tackles (the environment, animal protection, poaching, indigenous rights, politics etc. ), and the script by Sonia Borg (who also wrote the classic Aussie family film STORM BOY) does a really good job at exploring them while also giving us the thrills that we as an audience expect from a giant killer crocodile film. Director Arch Nicholson (who prior to this film was a 2nd unit director on the classic RAZORBACK and then helmed the 1985 Ozploitation thriller FORTRESS himself) did a great job with how he crafted DARK AGE. While he could have easily been approached as a rather silly B-movie, Nicholson takes the film’s story very seriously. He knows to build tension during the crocodile attack sequences extremely well and isn’t afraid to show how violent some of them can be. Plus while the climatic MAD MAX style car chase scene does feel like it belongs in a completely different film, it’s still a really riveting and well staged action set piece by Nicholson as well. Another thing that Arch Nicholson does really well as a director is that he knows how to get pretty good performances from his cast. As the film’s main character, lead star John Jarratt (WOLF CREEK) gives a great turn as ‘Steve Harris’. He gives an ‘every man’ quality to role that makes the character very likeable and relatable hero (which a stark contrast to his famous role as the terrifying ‘Mick Taylor’ in the WOLF CREEK franchise). While the script could have been given her a little bit more to do with her role, Nikki Coghill was still solid nonetheless as “Cathy Pope”. Indigenous actors Burnam Burnam and David Gulpilil were both really good as father & son ‘Oondabund’ & ‘Adjaral’ respectively. Especially in particular Burnam, who I thought brought some gravitas to his role. However when it comes to who I think was the standout among the cast, it’s definitely Max Phipps as the film’s true villain the crocodile poacher ‘John Besser’. His performance was terrific and you can tell that Phipps completely relished playing such an awful, vile character like him. On the technical side the cinematography by future legendary Oscar-winning THE LORD OF THE RINGS trilogy D.O.P. Andrew Lesnie is beautifully striking and Danny Beckermann’s score was a great mixture of intense and adventurous themes. Now were there any aspects of the film that I found to be flawed? As much as I hate to say, I thought the animatronic giant crocodile that they designed for film wasn’t very good at all. 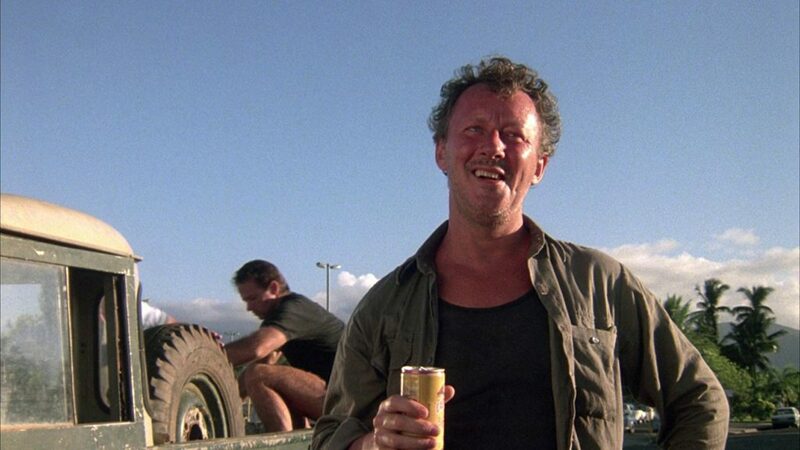 For most part Arch Nicholson takes the JAWS approach by showing very little of ‘Numunwari’ on screen but sadly as the film goes along and we see more of him, it’s very obvious just how fake and poorly made he looks. Plus the plot can be pretty cliched and formulaic at times (it uses a lot of the same story beats as JAWS), the romantic subplot between ‘Steve’ and ‘Carly’ could have been developed more, there are some moments that I thought were unintentionally silly and I found the ending a little too anticlimactic. Overall while DARK AGE isn’t a perfect film by any means, it’s still a really fun and engaging giant killer crocodile film. It could have easily have been treated as just another B-level monster movie but it’s pretty clear from beginning to end that both director Arch Nicholson (who sadly passed away after making both DARK AGE and his follow-up film WEEKEND WITH KATE) and his cast/crew definitely wanted to make something that’s a little bit more interesting than other similar films of its type. In that regard, I thought that they did a great job in achieving that. It’s still a shame that the film was shelved in Australia for 24 years but now that it’s widely available on both DVD and BluRay, it can finally get the attention and second life that it deserves. 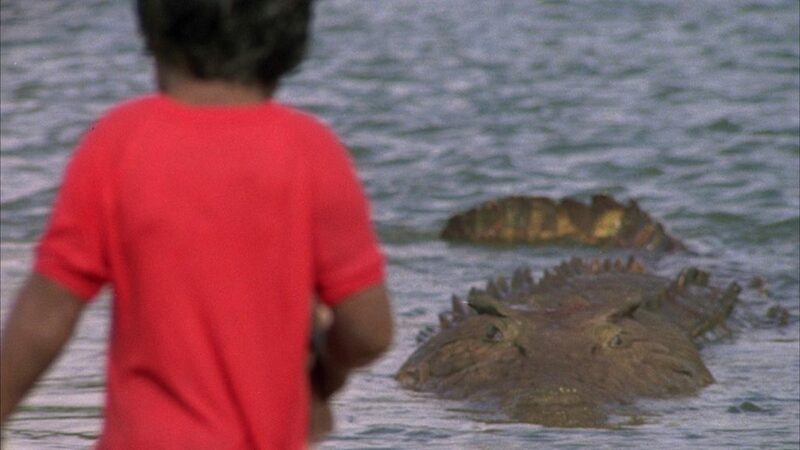 If you’re fan of killer animal films, especially of the killer crocodile variety, check this one for sure. This is definitely one Aussie horror film that you need to seek out. Note: DARK AGE is available to purchase either on DVD or Blu-Ray at Umbrella here or on just BluRay at GrindhouseVideo here. 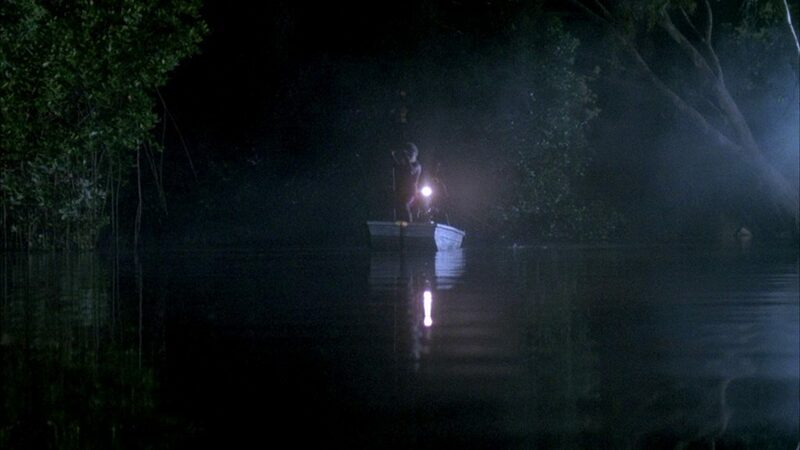 Is there any Australian horror films you would like me to cover for Horror Down Under? Leave your suggestions in the comment section below or tweet them to me at Twitter.com/BedeJermyn. I’ll put them under consideration for future editions of the column.